Anderson completed the 27th five-wicket innings haul of his record-breaking Test career as Windies were eventually dismissed for 289 an hour into the second morning of the first Test against England in Barbados on Thursday. 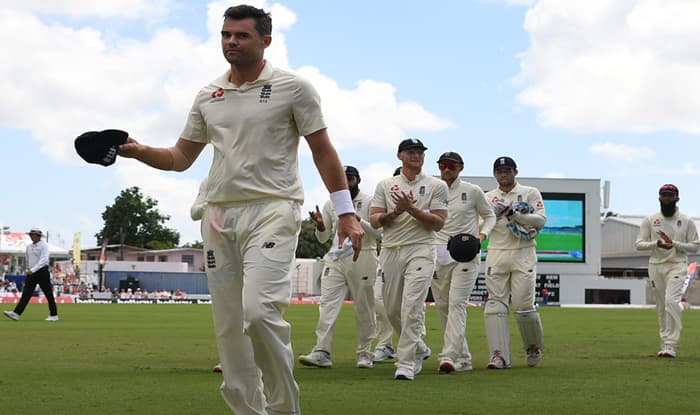 James Anderson completed the 27th five-wicket innings haul of his record-breaking Test career as the West Indies were eventually dismissed for 289 an hour into the second morning of the first Test against England in Barbados on Thursday. Having triggered a West Indies collapse with four wickets late on day one to reduce the home side to 264 for eight at stumps, Anderson ended the stubborn resistance of Alzarri Joseph when he was caught at third slip by Jos Buttler. Despite failing to score, Joseph partnered Shimron Hetmyer for almost an hour as the senior batsman added another 35 runs to the overnight score. With that strike Anderson equalled Ian Botham’s record for the most five-wicket innings hauls in Tests by an England cricketer. It was on England’s previous Test tour of the Caribbean that Anderson went past Botham’s tally of 383 wickets to become his country’s leading wicket-taker in the traditional format of the international game. Anderson’s long-time opening bowling partner Stuart Broad, who was surprisingly dropped for this opening Test, has also eclipsed Botham’s mark. His tally stands at 433 wickets while Anderson’s final innings figures of five for 46 off 30 overs lifted his number of Test victims to 570. Ben Stokes wrapped up the innings in the next over to finish with four for 59 when he had Hetmyer caught behind for a top score of 81. Hetmyer’s attractive innings included nine fours and two sixes off 109 deliveries and lasted almost three hours. His contribution was especially important to the home team given their slide on the evening session of day one when four wickets fell for 24 runs. West Indies captain Jason Holder snared the wicket of Keaton Jennings just before the interval as he sliced an attempted drive to Shai Hope at gully. Rory Burns and new batsman Jonny Bairstow will resume the England reply after the break.